While most of Zakat Foundation of America’s (ZF) programs are international, our Social Services Program was specifically created to help people in the Chicagoland area and across the United States. Alhamdulillah, ZF recently opened a new Chicago Community Center at 1759 East 75th Street in Chicago’s South Shore neighborhood to serve local community members. Thanks to the enthusiastic welcome and involvement of local community members we had our first event: an evening tea honoring mothers. Participating mothers received gifts and shared their wealth of knowledge as we talked about the community and our collective hopes and aspiration for it. In the community garden we are growing cauliflower, summer squash, cucumber, onion, pepper, tomato, spinach, lettuce, and parsley, which is soon to be harvested and shared with our neighbors. 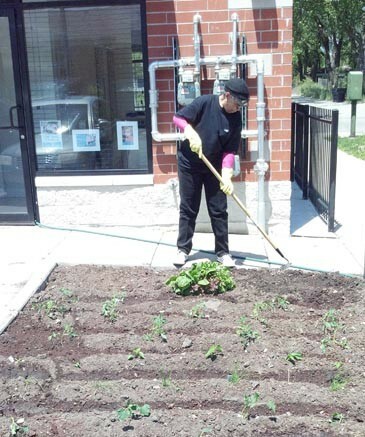 Some of the volunteers come by every day to help in the garden or with the cleaning of the center. Many community events at the center are scheduled for this summer, including our greatly anticipated Open House in July! ZF is committed to serving the needs of the community and we are excited about joining the South Shore community in Chicago to expand our reach.